The Austin Convention Center (ACC) is located in the heart of downtown Austin and serves as the Technology Partner and home base for SXSW. The surrounding area crackles with urban energy and features great venues and restaurants of the 6th Street, Red River, Warehouse, and Rainey Street Districts. We understand that your hotel location is key to a successful SX experience. Since not everyone coming to Austin can stay downtown, we work with a variety of transportation services to provide a comprehensive selection of transportation options including scheduled ride services through SuperShuttle and Austin Capital Metro bus routes. These options are available to help you design your commute to SXSW events within your individual budget and needs. Check out the Availability Page to see hotel rates and amenities before you register. 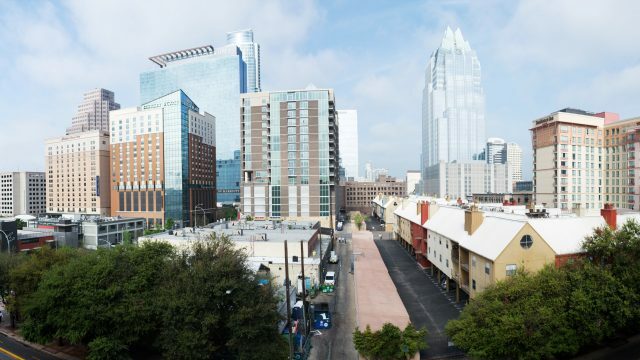 To help you find the location that works for you, browse our list of neighborhoods where SXSW Housing & Travel holds hotel rooms at the lowest rates. Many SXSW hotels are located on the fringe of downtown and still a convenient distance to the Austin Convention Center and Austin’s Capital Metro App bus system. The “university area” is vibrant with student life, shopping, and museums like the Bob Bullock and Harry Ransom Center. Just a short commute to downtown, South Austin hotels offer easy access around town. Take a quick cab ride or rideshare to the trendy and classic South Congress, South 1st, and South Lamar neighborhoods with dining, entertainment, and boutique shopping. The Austin–Bergstrom International Airport (ABIA) is a surprisingly quick trip to downtown Austin, making these hotels ideal for your stay, especially if you require a quick turnaround. While airport hotels are obviously the most conveniently located to the airport, they often offer airport transportation as well. These hotels are also the closest option to the legendary BBQ mecca of Lockhart, Texas. Hotels along the Interstate 35 corridor (IH 35) in North Austin are easily accessible to downtown Austin. Historic North Austin offers great local cuisine like Amaya’s Taco Village and Quality Seafood. Also, check out North Loop’s vintage stores, record stores, or hybrid coffee shop-cocktail spots within brightly colored buildings. Join us for another exciting event March 8-17, 2019 in Austin, Texas. SXSW registrants typically save 35-50% when booking through SXSW Housing & Travel versus online travel agencies and direct bookings. Register and then book your hotel early for SXSW 2019 to get the best available rates!